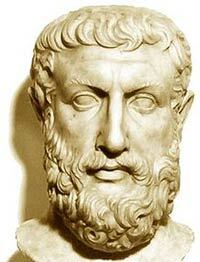 Parmenides (c.515-450 BC) was a prominent philosopher in ancient Greece. He founded the Eleatic school, which was named after Elea, the southern Italian city of his birth. Little has survived of his writings with only a single poem being definitively attributed to him, but he was still influential as a philosopher. Plato in particular was strongly influenced by his ideas about the nature of reality and how it often conflicts with what appears to be true. The life of Parmenides is shrouded in mystery with only fragmentary evidence having come down to our day. He seems to have been born into a rich and influential family, and was probably involved in the drawing up of the laws of Elea. The accepted dates of his birth and death that are generally accepted are derived from a biography by Diogenes Laërtius. However, since his work was written in the 3rd century AD, it may not be completely accurate. It is almost certainly true, though, that Parmenides lived the bulk of his life in the city where he was born. Elea was a relatively new city at the time, having been founded only a couple of generations before Parmenides’ birth. Nevertheless, it became the home of one of the ancient Hellenistic world’s most productive philosophical movements. The Eleatic school played an active part in Greek life for more than a hundred years, and several other first-rank philosophers studied there. Among the best known of Parmenides’ own students was Zeno, who is said to have invented dialectic and who is remembered today primarily for his paradoxes of logic. Xenophanes of Colophon was a major influence on the young Parmenides, although the little that is known about him suggests that the teachings of Pythagoras were also important factors in his philosophical development. Many philosophers at that time used poetry to set out their doctrines, and Parmenides named his simply On Nature. The poem On Nature originally ran to around 3,000 lines, divided into three sections, but only 160 lines have survived. It begins with a preface about a man who travels out of darkness into light on a chariot, which is an image also found in Plato’s works. After this opening, the most significant section of what remains follows. This makes the important distinction between what really is and what only seems to be. This deceptively simple statement, that being constitutes everything there is, can be said to mark the point at which Western philosophy truly begins. This is followed by a third section, which deals with opinion. Parmenides states that the majority of people live according to what they appear to see and experience, rather than employing true reasoning in order to discover what lies beneath. Parmenides can be seen as the first monist, pre-dating the likes of Baruch Spinoza by more than 2,000 years. Monism teaches that existence is eternal, unchanging, and undying, and that it is boundless and indivisible. Parmenides taught that philosophy itself was a way of life, in that philosophers begin a journey in darkness, then travel to the light that illuminates the truth they discover beneath the surface. In this way, conclusions that at first seem astonishing or even impossible can be proved by the use of reason.